Many dog parents out there including myself want the best dog food for our dogs but sometimes the best isn’t always affordable. 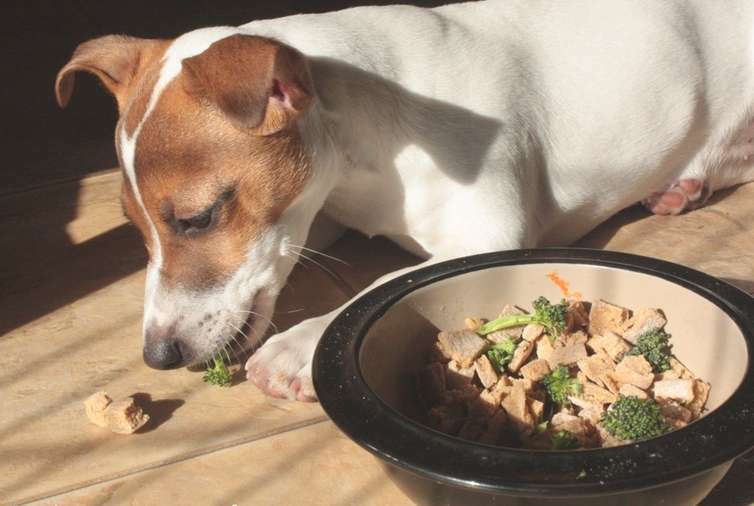 I want you to know that you can get a great dog food without the added costs which is why I am writing this Purina pro plan review. My Pit Bull is now reaching 5 years of age and she has been on Purina dog food most of her life specifically the Purina SmartBlend – Chicken; recently Purina came out with their Pro Plan line and of course I jumped on it, a 35 pound bag of dog food for $33.99 was too good to pass up. If you have a an Amazon Prime account, even better, you get free shipping! I suggest everyone to sign up for an Amazon Prime account, you can save tons of money in shipping costs. Right now, my Pit Bull Phoenix is on Purina Pro Plan Savor dog food. The Purina Pro Plan Savor line comes with the following flavors in their 35 pound bag selection. Shredded Beef and Rice Formula, Shredded Chicken & Rice Formula and the Shredded Lamb & Rice Formula. I haven’t tried all of their flavors as of yet, Phoenix was on their SmartBlend chicken formula before so I wanted to keep that going. Also from previous experiences, I found a niche for my dog and realized that she prefers dog foods containing chicken more than anything else. Although, a little more costlier at $37.59 dollars for a 33 pound bag, you can also try their Salmon and Rice flavor. 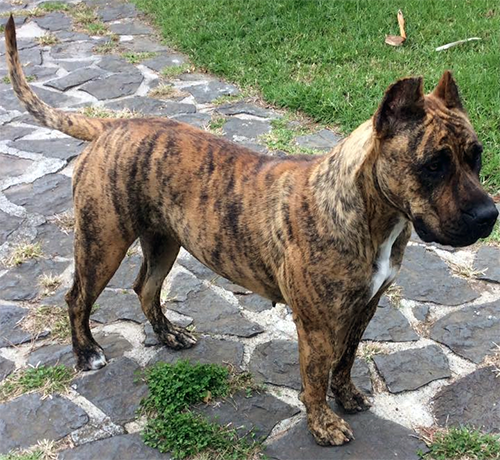 Although it contains more anti-oxidants and fish may be better for your dog’s skin and coat, not all dogs will take to this formula. I know my Pit Bull prefers the taste of the Chicken and Rice flavor. If I ever decide to try the Salmon and rice flavor with my dog, I will probably get some Purina wet food and mix it in which contains the chicken flavor. I have been a Purina customer for a few years now and so far they haven’t let me down. Overall, I am completely satisfied with the Purina Pro Plan Savor line of dog foods, the fiber content in these dog food formula is around three percent. I haven’t run into any constipation issues with my dog while feeding this brand. I found my dog’s stools to be firm and she will go potty regularly 2 times a day. 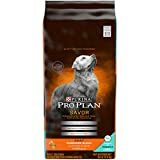 Purina Savor dog food keeps your dog healthy and active, I didn’t notice any weight gain issues with my dog after switching to the Pro Plan line. Purina also includes glucosamine in their dog foods to help support healthy joints and mobility in our canines. If you have puppies, you can start them on Purina Pro Plan starting at three or four weeks of age. Keep the food moistened while feeding puppies so that it is easier for them to eat. I suggest at around 12 weeks of age, you keep them on dry food alone. 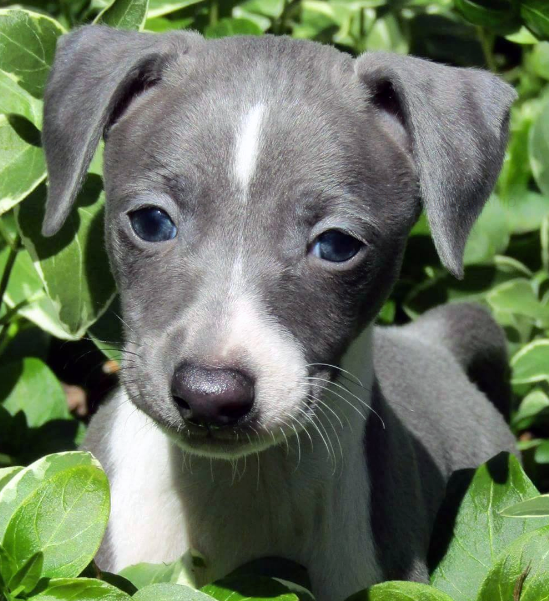 You can also start off your puppies on Purina wet foods till they are about 8 weeks of age. If you have any questions or comments please add them below. 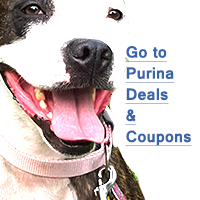 You can also check out these Purina Pro Plan coupons and deals on select Purina dry and wet foods. What is your favorite Purina dog food formula and why?